VICE President Yemi Osinbajo, yesterday, told Nigerians not to allow the Peoples Democratic Party, PDP, return to power in the 2019 elections, saying the motive behind the party’s desperation is to loot the nation. VP Osinbajo delivers keynote address during the townhall meeting. 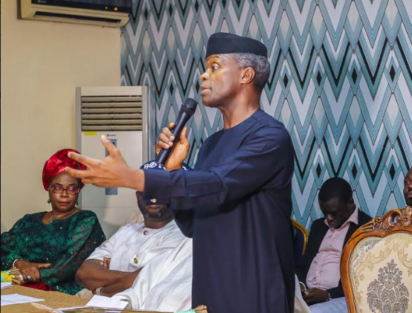 Osinbajo said but for President Muhammadu Buhari’s honesty and sincerity of purpose, Nigeria’s economy would have collapsed long ago, saying only selfless leader like the President can be trusted with the nation’s wealth. The Vice President spoke during a Roundtable and Mentorship Programme on Micro, Small and Medium Scale enterprises, MSME, in Ado Ekiti, Ekiti State. The Tradermoni programme was done in Ado Ekiti metropolis, Ikere and Omuo Ekiti in Ekiti State. Osinbajo also visited Iworoko Ekiti, where trailer rammed into market and killed 15 persons a couple of weeks ago to commiserate with the indigenes of the town. His words: “Many of our leaders are not responsible, so Nigeria needs a honest man to lead the people and President Buhari is doing just that. Don’t allow anybody to deceive you. President Buhari is an honest man, Our problem in this country is that many of our leaders are stealing our money, so you must disallow them from coming to power again. “Rather than stealing money, President Buhari is doing more in strengthening the youths through N-Power, Tradermoni, School Feeding Programme, Lagos-Kano rail line, Calabar—Asaba-Abuja Railway line, Lagos-Ibadan express way, among others. All these are meant to benefit Nigerian masses. “As we speak, 500,000 Nigerians are benefiting from N-Power, but we are not going to stop at that. Soon, the number will increase. In his remarks, Governor Kayode Fayemi of Ekiti State appealed to Nigerians to vote for Buhari’s continuity, if they want good values for their lives in terms of good governance and prudent management of the nation’s wealth. Fayemi said: “If you want better values for your lives, if you need a government that will be compassionate and resourceful, and then vote for Buhari/Osinbajo in the next election.